Enjoy a World of Convenience, with Cargills Bank Mobile Banking. Self-Register for Mobile Banking, within 5 Minutes! Get complete control of your bank account now on your mobile!! 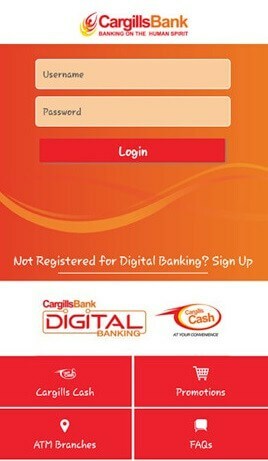 Cargills Bank “Digital Banking” gives you the convenience of accessing all bank online channels (Internet Banking / Mobile Banking – Mobile Application and USSD Banking) via Single User ID and Password. This unique feature brings much awaited convenience to Bank Customer by introducing “Omni-Channel” concept to Sri Lankan Banking industry. Visit your nearest Cargills Bank branch or talk to one of our dedicated bank representatives, at Cargills Food City outlet to register with Cargills Bank Digital Banking. You will receive access information (User ID and the Password) within one working day. User ID will be informed via email and One Time Password (OTP) will be sent to your registered mobile number. The One Time Password (OTP), sent to your registered mobile number should be changed immediately according to your preference. Create a strong password using Password Policies given below. For the first time in Sri Lanka, you can deposit and withdraw cash at any Cargills Food City outlet and purchase goods using your mobile phone. You can Send Cash instantly to any mobile phone, and Withdraw Cash from any Cargills Food City outlet. Schedule your fund transfers or bill payments with three options available – Immediate, Future and Recurring Transfer. Standing orders – Submit standing order instructions and view existing standing orders. Mobile banking – USSD version is compatible to all phone models & the facility is available on the Dialog Network. No special Mobile App or mobile internet data facility is required to access this facility. Submit your Mobile Banking Application form to the nearest Cargills Bank branch. You will receive a One Time Password (OTP) to your registered mobile number. Simply dial #323# and change the One Time Password (OTP), to a new password immediately according to your preference.